Antica Posta di Braccio is a residence and restaurant in Umbria. It is a picturesque conglomerate of houses in typical Umbrian style with delicious red roofs and set in a lush green countryside. It sits right besides the Trasimeno Lake sporting one of the most magnificent views over one of its islands and offering a peaceful stay for short and long term holidays in Umbria. You will find it over the southern shore of the Lake near the town of San Arcangelo di Magione. The origins of the palace are in the Renaissance period and its style is typical from that age. The restaurant specializes in truffles, an Umbrian specialty. The summer garden is a wonderful place where to enjoy the meals cooked with the ancient wood brick oven. This is a historic place that started its hospitality tradition in the 15th century, hosting those who traveled these lands. That tradition continues to these days where guests are accommodated into 20 splendid apartments all boasting independent entrance and self catering services. This is also the ideal place if you need a large accommodation for your guests to celebrate a happening such as a wedding or a get-together, a birthday, or a company meeting. The large cross vaulted rooms are the ideal setting where to gather many people at once in an elegant and functional space. The entire structure is immersed in the green setting of the Trasimeno Park. The efficient organization of this residence in Umbria will provide anything you need to make it happen for parties, large meetings, and conferences. 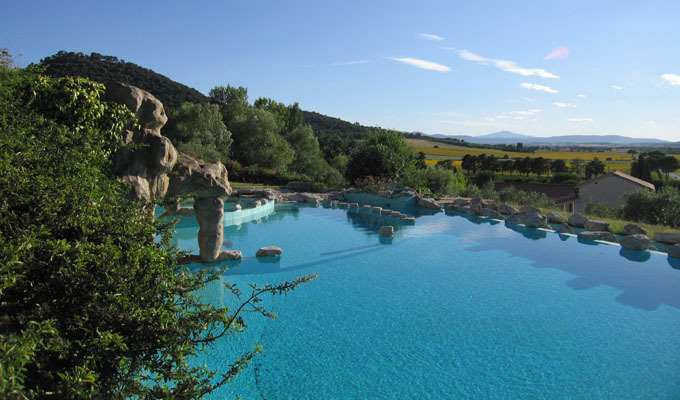 To top it all on the property grounds you will find a splendid swimming pool–pond decorated with submerged stone blocks and set in stone for a terrific visual impact and pleasurable relaxation. The pool also includes a Jacuzzi in an elevated and panoramic position commanding views over the Trasimeno area.